A Dr. David Wartinger of Michigan State University published a medical study suggesting that a ride on Disney World's Big Thunder Mountain roller coaster can be beneficial. 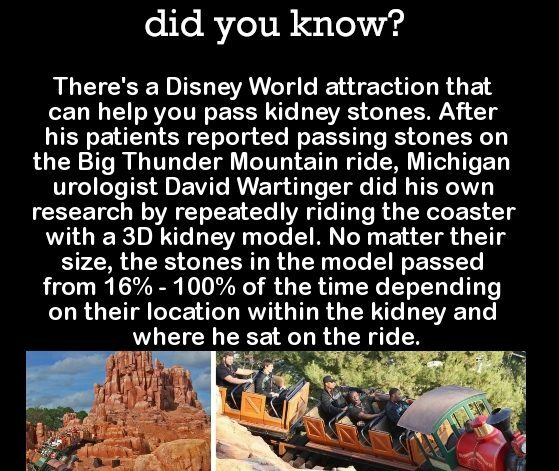 Taking one or more rides on the Big Thunder Mountain roller coaster at Walt Disney World can help dislodge kidney stones. Ask anyone who has experienced a urinary blockage due to kidney stones and they will tell you there is nothing fun or remotely pleasant about the experience. Caused when salt and mineral residues form small “stones” inside the kidneys that move and become stuck in the ureter (the passageway via which urine passes from the kidneys to the bladder), a kidney stone blockage often results in severe pain, bleeding, nausea, and vomiting. Sometimes, especially when the stones are small, they eventually pass through the ureter and are excreted without medical intervention. Larger stones usually require treatment, which may involve one or more of the following: medication to relax the walls of the ureter; extracorporeal shock wave lithotripsy (ESWL) to break up the stones into smaller pieces so they can pass in the urine; ureteroscopy, a minimally invasive surgery in which a small tube is inserted into the urinary tract to break up the stones and remove them; or a surgical procedure to excise the stones if they are very large. Or, according to urologist and professor emeritus in the Department of Osteopathic Surgical Specialties at Michigan State University Dr. David Wartinger, DO, you could consider the lower-cost alternative of taking a ride on the Big Thunder Mountain roller coaster at Walt Disney World in Orlando, Florida and letting the force of gravity do the work. Wartinger made a media splash in September 2016 by publishing a study in the peer-reviewed Journal of the American Osteopathic Association stating that experiments he performed using a lifelike silicone model of the human urinary tract confirmed that “roller coaster facilitation of calyceal renal calculi passage” (i.e., taking a roller coaster ride to facilitate the passage of kidney stones) may be a feasible alternative to standard medical treatment in some cases. Chu Lang-hsuan, a doctor in the Department of Urology of Taichung Hospital, said on Thursday that after accompanying a group of Rotary students bungee jumping over winter vacation, a chaperone suddenly had severe pain in the back and stomach about 10 minutes after the activity. Upon his return to Taichung, he went for a medical examination, where blood studies and X-rays gave a preliminary indication that a kidney stone had lodged in the urethra. The stone was about 0.6 cm in size, and was broken up using extracorporeal shock waves, after which the man was able to pass it. The doctor suspects that the stone moved from the kidney into the ureter during the free fall activity. Chu says that when he started asking around, he discovered that another 30-something man had come into the hospital three years ago on four occasions for the same sort of complaint. Each time, shortly prior to the onset of the pain, he had been riding a roller coaster with his children. After going to the hospital, the man was told each time that a kidney stone had lodged in a ureter. Could it be that activities involving free fall can be helpful in passing kidney stones? If you have a kidney stone, but are otherwise healthy and meet the requirements of the ride, patients should try it. It’s definitely a lower-cost alternative to health care. We hasten to point out that Dr. Wartinger did not recommend foregoing diagnosis or treatment by a medical professional in favor of taking a roller coaster ride. Note, too, that the research was conducted not using actual human subjects, but rather a urinary tract simulator made of silicone (though the kidney stones used were real). Despite the doctor’s enthusiasm, therefore, in the absence of any follow-up research confirming his results, the study cannot be considered conclusive; it does not suffice to prove that a roller coaster ride is an effective means of dislodging kidney stones. All we have, to date, is preliminary evidence suggesting that a ride on Disney World’s Big Thunder Mountain roller coaster may help some patients spontaneously pass kidney stones (and only “very small stones” at that, according to a urologist familiar with the study consulted by the New York Times in 2016). Wartinger indicated as much himself in comments quoted in Slate shortly after the study was published. “This is the validation model for getting the attention to do the human trial,” he said. 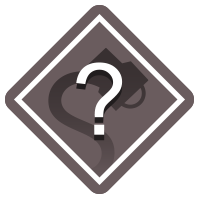 No human trials have yet taken place. We reached out to Wartinger for further comment but had not heard back by publication time. The Journal of the American Osteopathic Association. October 2016. The New York Times. 3 October 2016. USA Today. 28 September 2016.